Think of any oppressive regime in history. Do you recall the British rule of 18th century America? 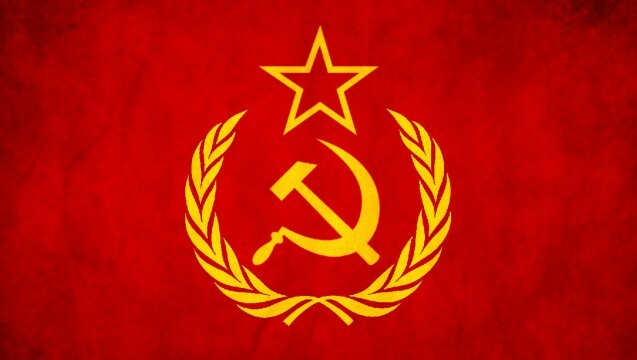 Joseph Stalin’s Soviet Union? Now think of the individuals who played a major role in reform and courageously spoke against the autocratic rule. We remember names like John Locke and Benjamin Franklin with ease, but rarely do names like Dmitri Shostakovich or Jacques Offenbach even come to mind. Though artistic endeavors are often viewed as less crucial than scientific or mathematical ones—one need only to look at the most recent budget cuts in secondary school education to confirm that this is true—creative expression through the performing arts is one of the most powerful means of maintaining freedom in the public sphere. In this essay, I will first demonstrate what freedom in the public sphere entails and then show that our ability to creatively and freely express ourselves is a crucial component of an enlightened society. German philosopher Immanuel Kant provides valuable insight into what we mean by “freedom in the public sphere” and what an “enlightened society” might be. In his essay What is Enlightenment?, Kant highlights the distinction between the private sphere and the public sphere by noting that an individual in private is usually driven by “rules and formulas…mechanical instruments of a rational use (or rather misuse) of his natural gifts” (Kant 59). These “rules and formulas” render the individual “incapable of making use of his own reason, because he has never been permitted to make the attempt” to do so (Kant 59). Freedom is therefore difficult to achieve in isolation and within the safety of one’s private sphere; in order for us to become enlightened, we must interact with other individuals in the public sphere. Kant further posits that individuals in their professions and families and even in certain obligations of citizenship—such as paying taxes—should give in to the dictates of their societies because in doing so they are ensuring that freedom is able to thrive by preventing their society from falling into anarchy. He demonstrates this idea by using an example of an officer, nothing that “it would be very destructive if an officer on duty should argue aloud about the suitability or the utility of a command given to him by his superior; he must obey” (Kant 60). Kant highly values order and peace, and thus he is a strong proponent of citizens in the private sphere following rules and laws to the best of their ability. However, this does not mean the citizens cannot express dissent where they see fit. This important distinction separates Kant’s rather grim portrait of an individual in the private sphere with an empowered individual in the public sphere, henceforth referred to as a “scholar”. This scholar, through his interactions with others and free expression of ideas in the public sphere, helps achieve freedom in the public sphere by spreading “the spirit of rational assessment of individual worth and the vocation of each man to think for himself” (Kant 59). This, ultimately, is our understanding of an enlightened society: one where freedom of the press promotes discussion and debate among scholars—and even gives them a platform to freely voice their critiques of reality—in the public sphere. Freedom in the public sphere, then, is a necessary precursor for an enlightened society; one cannot exist without the other. German philosopher Hannah Arendt, in Between Past and Future, provides additional insight into what this “freedom in the public sphere” entails. She notes the important distinction between “freedom of choice” and “freedom as related to politics” (Arendt 150). The former is “predetermined by motive” and is “a phenomenon of the will,” while the latter is driven by principles, which are beyond us and greater than we are (as opposed to internal motivations which are usually self-serving) and which become “fully manifest only in the performing act itself” (Arendt 151). Thus freedom in the public sphere appears “whenever such principles are actualized…with [a] performing act… [and] to be free and to act are the same” (Arendt 151). We are now able to contextualize the importance of the performing arts in light of this new understanding of freedom in the public sphere. Inherent in both the performing arts and freedom as manifested through actions inspired by principles, as Arendt shows, is an element of virtuosity; after all, the accomplishments of both are realized only through a transient performance. Thus, an enlightened society recognizes freedom as a product of action and requires the “existence of a space where freedom as virtuosity can appear,” similar to how a performing artist requires means by which his or her creative pieces can be performed (Arendt 153). 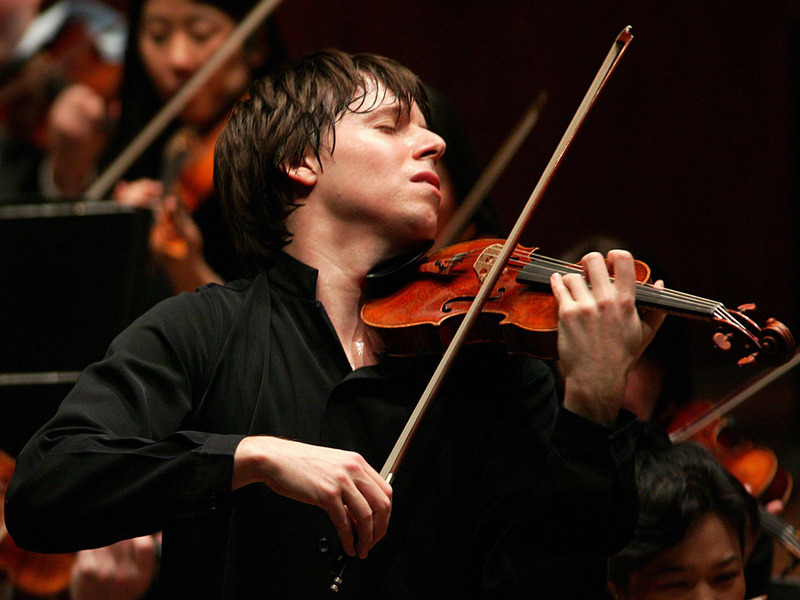 Joshua Bell, a famous American violinist, in performance. Though Arendt uses the performing artist as an analogy to underscore the raison d’être of freedom in the public sphere, the performing artist can actually exercise an important political role, especially in societies or circumstances where access to the public sphere has been limited. In adopting Kant’s view of an enlightened society as one which is able to freely express itself in the public sphere, we have assumed the existence of a governing body that allows this freedom of speech. But what if freedom of speech in its most literal sense—our ability to use words to “make remarks on failings…and lay them before the public for judgment”—has been robbed from us, as is the case in times of totalitarian rule (Kant 60)? This is where the performing artist can play an important role; as a medium, music transcends the physical limitations of language and, perhaps more importantly, has the power to effect change and revolution in ways words cannot and never will be able to. I say this not to cast doubt on the efficacy of spoken language as a means of communication but rather to highlight the often ignored importance of the performing arts as a method which we can use to protest the destruction of the public sphere and even to recreate it in a musical performance, if only for a few moments. Many moments in history prove this to be the case. 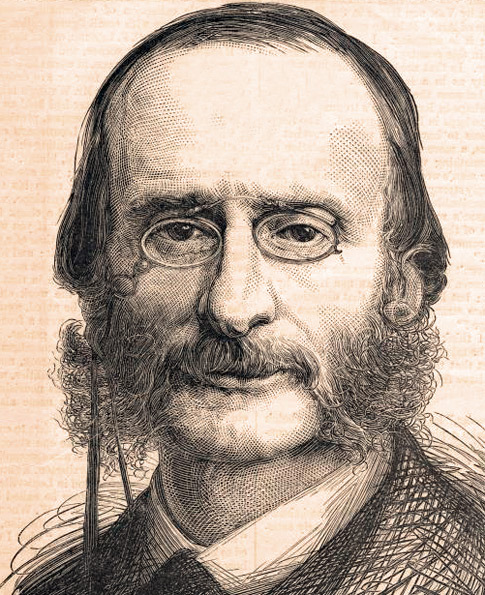 Consider the French composer Jacques Offenbach, who is best known for his satirical operettas written during the 19th century. At a time when powerhouses such as Giuseppe Verdi and Vincenzo Bellini dominated European theatrical stages, Offenbach was able to rise to fame most notably in South America, particularly in Rio de Janeiro. By offering a taste of “the Parisian craze that could be enjoyed conveniently in a most informal ambiance, far from the social conventions of the opera house and the formalities of upscale musical societies,” Offenbach’s oeuvre filled a unique niche for audiences of all socioeconomic statuses through “light French entertainment offered at a lower price than at the opera house” (Magaldi 97-98). By engaging audiences not typically part of the affluent bourgeois opera-goers, Offenbach and his operettas reached a much larger community and were propelled to international celebrity status by the 1860s. For the middle class citizens of Rio de Janeiro under the imperial dominance of Pedro II, Offenbach’s operettas were particularly significant because they performed the European values these would-be citizens felt that they lacked in their own political contexts. Offenbach’s famous can can dance. “…the riotous dance was suitable for voicing the most daring political statements and satires…[the Cariocas] danced the imported cancan to comment on the hypocrisy of the local society, and used the dance to ‘openly’ criticize the institution of slavery and to support Republican agendas…they madly danced the cancan in the streets of the imperial capital surrounded by ‘the people’ in an attempt to re-create in Rio de Janeiro a pretend local ‘Liberté, egalité, fraternité” (Magaldi 103-104). 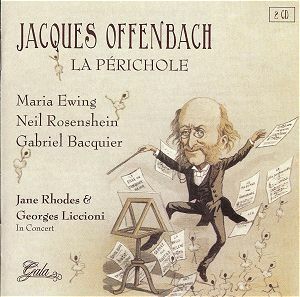 Jacques Offenbach dancing his famous can can dance from the opera Orphee Aux Enfers. As the oppressed Cariocas demonstrated, the performing arts of dance and the opera allowed them to find freedom in the public sphere in many ways, even when it had otherwise been taken away from them. First, the performing arts served to unite two disparate groups of people—the Cariocas and the French citizens—over the common cause of freedom. The Cariocas were inspired by the obvious, impudent satire of Offenbach’s operettas to freely voice their opinions against the imperialistic rule of Pedro II. 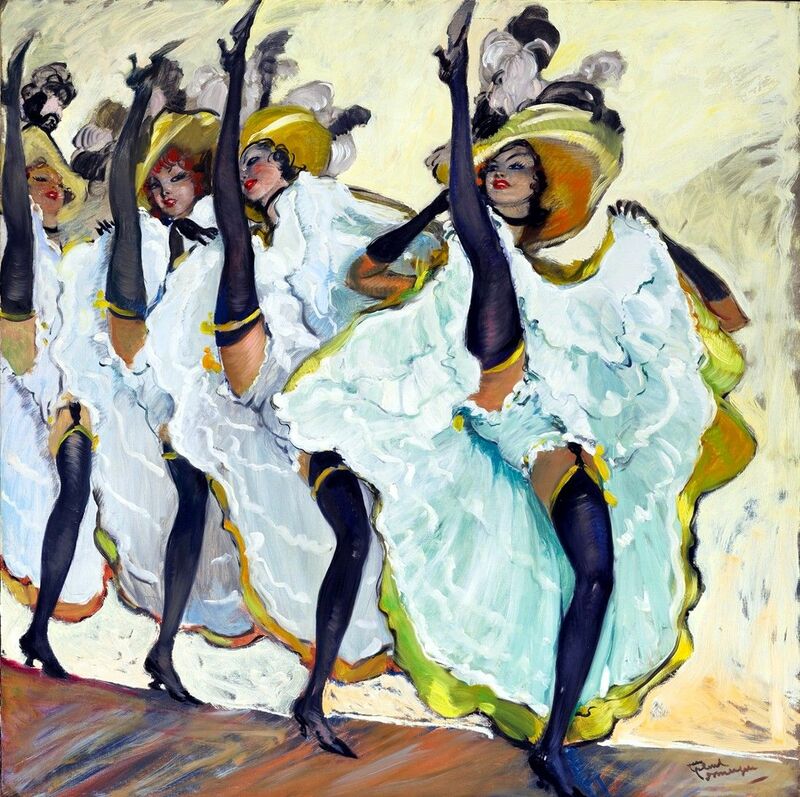 And in adopting the performing arts—in this case, the cancan dance—as their medium of communication, the Cariocas were able to spread their fervor in a very efficient and effective manner so that soon their entire society was empowered by the movement. In this case mere words were powerless not only because of the restrictions on free speech in the public sphere but also because of the physical limitations of the language barrier that existed between the two societies. Regardless of the common themes that one society found in the other, the uniting ideas could not be spread were it not for the existence of a platform which could be universally understood by both parties, and in this case the cancan dance served as the vehicle by which ideas could be translated from one group to the other. And thus we see how performing arts not only keeps freedom alive in the public sphere by giving it a universal platform for the performance of free acts but also how the performing arts are an important vehicle in spreading enlightened ideas in the same manner that Kant envisions a society slowly becoming enlightened. Secondly, by boldly and freely expressing their opinions through performance, the Cariocas were able to find an alternate means to virtuously perform an act of freedom in a situation where their words simply fell flat against Pedro II’s ears. The movement which the Cariocas started through their rebellious cancan dance inspired such fervor among the citizens that their complaints could no longer be reasonably ignored by the government. The performing arts thus served as not only as an alternate stage for citizens to perform acts of freedom but also as a means by which they were able to add an extra degree of significance to their words. “Totalitarian rule cannot allow and will prevent the formation of independent and alternative pubic spheres in its midst. A totalitarian society begins to transform its nature when the number, frequency, outreach, and intensity of modes of social relations constituting an alternative ‘public’ begin to increase in number…for a multiplicity of public spaces are the sine qua non of an independent and vigorous civil society as a component of democratic cultures everywhere” (Benhabib 74-75). The times of Soviet rule were thus extremely difficult for Shostakovich—his release of the opera Lady Macbeth of the Mstensk District led to his denunciation and shaming by the Soviet government, sending a clear signal to all about the types of expression that were and were not accepted by the regime. Shostakovich, however, was not hindered and remarked: “Even if they cut off both of my hands and I have to hold the pen in my teeth, I shall still go on writing music” (Shostakovich xix). A close analysis of Shostakovich’s Seventh Symphony, titled Leningrad after his hometown, reveals how important music as a medium can be to maintaining freedom in the public sphere, even in a totalitarian setting. The formal, almost forced opening to the Seventh Symphony has all the string instruments playing in unison with a simple yet powerful timpani and trumpet call underneath the moving string lines. 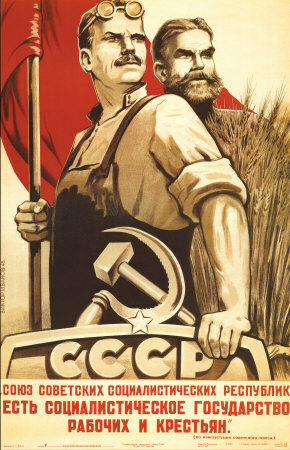 Shostakovich uses this “businesslike mood of almost stupid confidence” to mock the “the studied simplicity of totalitarian poster art – of the big, square-jawed smiths and lathe-workers, the ruddy-faced milkmaids and harvest-girls of Socialist Realism’s ‘radiant future’” (MacDonald 157). An example of Socialist Realism poster art Shostakovich mocks in his Seventh Symphony. The veiled criticisms and symbolism found in Leningrad become more apparent as the piece progresses beyond the introduction. The famous Leningrad march has a superficially simple interpretation: it is clearly a warlike march meant to represent the advancing German army. And for most people, “since the most overwhelming fact of life in Soviet Russia in 1941 was the German invasion, the idea that the march in the first movement of the Leningrad symphony concerned anything else was never even considered” (MacDonald 159). Upon closer examination, however, the march itself is a blend of different German and Russian flavors; it quotes many passages from Tchaikovsky (especially his Symphony Pathetique) and most notably bears an “overt likeness to a tune from The Merry Widow, Hitler’s favorite operetta” and almost irreverently mocks it (MacDonald 159). And while the march pushes forward strongly, its melody appears to be lost; it struggles to find a home and almost stupidly blunders through multiple keys, starting first in C major, then modulating to C sharp minor, and then G major, and finally, after being chased away by the admonitory calls of the horns one too many times, ends where it began, with no resolution, in its original C major. It is very likely Shostakovich intended this to decry and mock the lack of direction and even ultimate hopelessness of the Soviet government. We get more and more clues about the references Shostakovich makes to his government and oppressive society the further we listen; ultimately, it is clear that Shostakovich intended for his Seventh Symphony to “fundamentally [be] a satirical picture of Stalinist society” (MacDonald 159). Thus we see that music for Shostakovich served as a medium through which he could express his thoughts as a “scholar” to the general public. 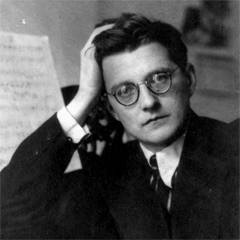 In this sense music was, again, a more powerful means of expression than words; through music, Shostakovich was able to freely express his criticisms against his oppressive government in a way that would certainly have led to his deportation or even death had he chosen to express those same thoughts with words. Through the performance of this piece, Shostakovich was able to “perform freedom” and to spread his message to others thereby recreating the public sphere—if only for a moment—as a medium where provocative ideas and thoughts could freely be exchanged. In the case of his Seventh Symphony, his efforts were clearly very powerful; as Solomon Volkov notes in his book Shostakovich and Stalin, “the 7th symphony was turned into a symbol of cooperation and spiritual unity of the Russian and American people in their struggle against the Nazis” (Volkov 181). And here we see again, just like with Offenbach and the Cariocas, how the acts of freedom—by means of the performing arts—of one individual were responsible for inspiring and creating acts of freedom throughout the societies in which he lived. Offenbach and Shostakovich serve as two extremes that demonstrate the prevailing importance of the performing arts, especially in times when our freedom in the public sphere has been limited. Mankind, in order to perpetuate his freedom, needs a stage in which he can freely voice his thoughts. The performing arts serves as a solid foundation in which we can do just that. In times when the use of spoken language is not sufficient, as was the case of Shostakovich, the performing arts serve as a crucial alternative with which we can still creatively express ourselves. And in the case of Offenbach the use of the cancan dance certainly increased the effectiveness of the discontented words of the Cariocas. Finally, both Shostakovich and Offenbach clearly demonstrate how the performing arts serve not just as a method by which freedom is spread but also, and more importantly, as an empowering tool that inspired some of the most important movements for freedom we know today. The universality of music and its unspoken ability to affect us on multiple levels establishes it as a more than effective means to find enlightenment in our societies today. We must no longer underestimate this powerful means of expression because in doing so we undermine one of the most powerful means by which we can obtain freedom in our society. After all, as Ilia Ehrenberg shrewdly notes: “Music has an enormous advantage: it can, without mentioning anything, say everything” (324). Arendt, Hannah. The Origins of Totalitarianism. New ed. New York: Harcourt, Brace & World, 1966. Print. Arendt, Hannah. “What Is Freedom?” Between Past and Future. New York: Penguin, 1977. Print. Benhabib, Seyla. The Reluctant Modernism of Hannah Arendt. Thousand Oaks: Sage Publications, 1996. Print. Ehrenburg, Ilia. Li︠u︡di, Gody, Zhiznʹ. Moskva: Sovetskiĭ Pisatelʹ, 19. Print. MacDonald, Ian. The New Shostakovich. Boston: Northeastern UP, 1990. Print. Magaldi, Cristina. Music in Imperial Rio de Janeiro: European Culture in a Tropical Milieu. Lanham, Md. : Scarecrow, 2004. Print. Shostakovich, Dmitrii, and I. Glikman. Story of a Friendship: The Letters of Dmitry Shostakovich to Isaak Glikman, 1941-1975. Ithaca, N.Y.: Cornell UP, 2001. Print. Volkov, Solomon. Shostakovich and Stalin: The Extraordinary Relationship between the Great Composer and the Brutal Dictator. New York: Alfred A. Knope, 2004. Print.